BASSETERRE, ST. KITTS, SEPTEMBER 24TH 2017 – The recent decision by St. Kitts and Nevis’ Prime Minister Dr. Timothy Harris announcing a drastic 50 percent cut in the investment requirement for its citizenship by investment (CBI) program, ostensibly to create a “hurricane relief fund” has drawn widespread condemnation, including one CBI consultant who described the move as shameful. “This is a truly shameful move by St Kitts,” said Mahdi Mohammed, CEO of Guide Consultants in a comment carried by Caribbean News Now. He noted that the tourism, communications and transportation infrastructure in St. Kitts is back to normal. Dominica on the other hand has suffered billions of dollars of damage. 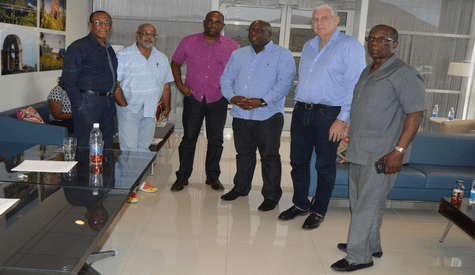 Photo – Dominica Prime Minister Hon. Roosevelt Skerrit (third from left), st. Kitts and Nevis Prime Minister Dr. Timothy Harris (fourth from left) and Prime Minister Allan Chastanet of St. Lucia during a visit to St. Kitts following Hurricane Irma. Although St. Kitts and Nevis suffered minimal damage, Prime Minister Skerrit made a donation of EC$500,000.